As human beings, we think we know it all. Yet we still have so much more to learn and to some degree, we may never know everything there is to know. If we were to observe things that move and grow around us, things that have been here for perhaps millions of years before man, we could learn much about endurance and survival and about working together for the same desire of all things... to keep living. Trees are numerous throughout the earth, despite man's carelessness and greed. Many still remain standing today because they are strong although weathering many different kinds of storms. Their roots are deep and they produce many seeds. 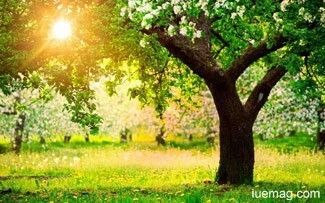 How wise it would be to learn now that to preserve the existence of humans, we need to take care of our trees. Like the clouds that surround the sky and trees. Yet the day will continue to move along; also for every human being. To others the day may be void of joy; depressing. No matter what the day will bring, they will still reach, be the best tree they can be. To move away from doubts, will they stay in the "middle," or go to the "left" or "right?" Yet they can decide to allow doubts to hang over them like clouds, or they can change their path somewhere along the line. So too those who doubt need to let go of their fears or whatever holds them back, and seek find the sunlight in their life. Any facts, figures or references stated here are made by the author & don't reflect the endorsement of iU at all times unless otherwise drafted by official staff at iU. This article was first published here on 27th October 2014.